Jordan McDowell was racially profiled in a Santa Fe, NM., convenience store on Aug. 3. Are you as tired of hearing these stories as we are? Do you understand how horrible it is that black people can’t even mind their own business and buy snacks in peace without people weaponizing the police against them? At what point are these phone calls going to be declared a crime? At what point will the callers be punished? Until such time as it becomes a criminal offense to use the police as your personal concierge service that functions solely to harass black people that you see as a nuisance or an inconvenience, we are going to continue to call these people out. And yes, they deserve whatever happens to them in the aftermath. 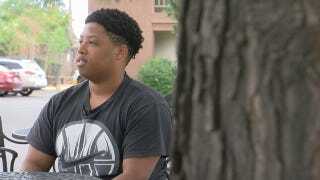 A clerk at an Allsup’s convenience store in Santa Fe, NM., called the police on 22-year-old Jordan McDowell—a student at Xavier University, the only historically black Roman Catholic higher education institution in the United States. McDowell told KRQE that he visited the store Friday at around 8 p.m. to buy candy. After he made a few purchases, he continued to look around the store for something else to buy. That’s when he noticed the clerk had been in the corner watching him the entire time. According to KRQE, Santa Fe police were dispatched to the store. The call was listed as “disorderly conduct,” but the officers acknowledged that McDowell had not done anything wrong. A man who identified himself as the manager of the convenience store told KRQE that the clerk’s comments and her behavior were unacceptable. He told KRQE that he doesn’t harbor any bad feelings about the incident, but he wants others to know what happened, and he encourages others to speak out when they have similar experiences. So yes, Jordan McDowell. We will continue to report it whenever people weaponize the police against you or any other black person.